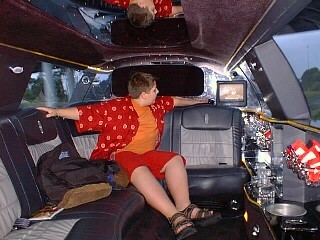 This is the stretch limo that picked us up at Orlando Airport and whisked us away to start our Disney World adventure. It was drizzling in Orlando that evening and we didn't even care, we could've ridden around all night! 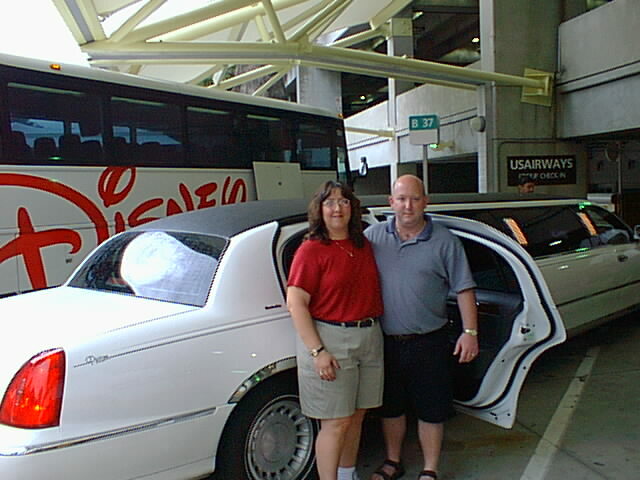 The company we used is called Tiffany Towncar and we'll be using them again for our February 2002 trip to Disney World. There is nothing like getting off an airplane and seeing your driver holding a sign with your name on it! Our driver was very nice, courteous, and helpful. Ahhhh....THIS is the life! Here is Robby enjoying the good life! The bar inside the limo was stocked with all kinds of ice cold soft drinks and bottles of spring water. 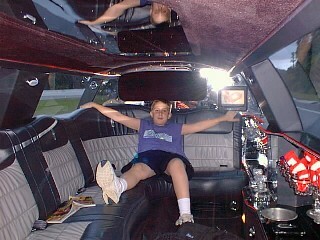 Craig loved having a DVD player in the limo! There were several movies to choose from. 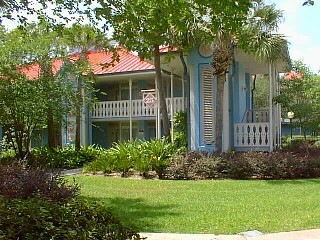 Here is the outside of Custom House at Caribbean Beach resort where you check in. Our driver pulled in and took our luggage from the limo, then a valet from the resort took over and handled our luggage for us. On the day we were leaving, our limo driver picked us up on time and was even a little early! 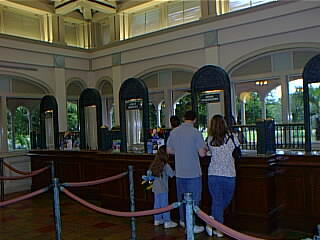 This is inside Custom House where you will find the Front Desk and Guest Services. 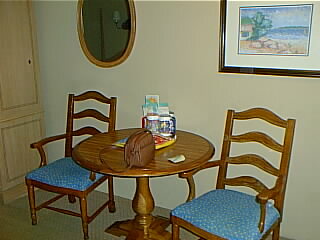 The upholstery on these chairs looked brand new and matched the fabric of the bedspreads as well as the shower curtain. 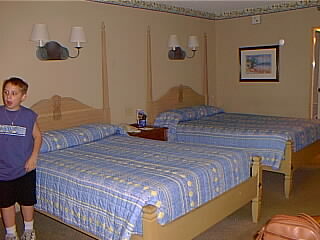 The room had 2 full-sized beds which were very comfortable. As soon as we got to our room I called Housekeeping and requested 4 more pillows and 2 extra blankets. Then we went to dinner. When we returned, the pillows and blankets were waiting for us. Here is our building, Martinique 25. 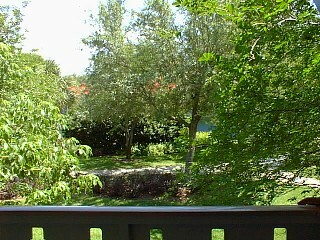 It was the perfect location, close to the beach and lake, with no parking lot views at all. We were close to the food court, main pool, and the Martinique bus stop. I highly recommend this location. There were pretty signs all over the resort like this one, pointing you in the right direction, to the beach, Old Port Royale, etc. Our building is just off to the right. This was the view we had out of our window. It's considered a "standard view". It was very peaceful and tranquil here, yet just a short walk to the bus stop, pool, food court, etc! 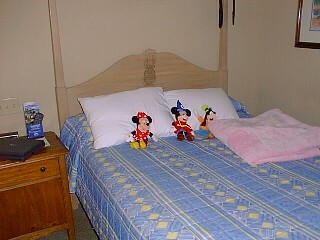 The housekeepers put our souvenir Minnie, Mickey, and Goofy on the bed for us one day and even made birds out of washcloths. This is what we saw when we walked to the back of our building, towards the food court Old Port Royale. This picture looks just like a postcard and it still doesn't do this resort justice. 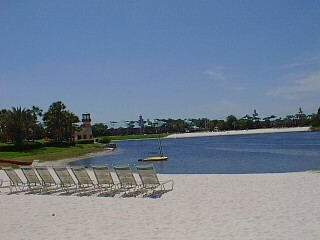 The white-sand beaches at Caribbean Beach Resort are beautiful. We couldn't resist taking our shoes off and wiggling our toes in the soft sand. 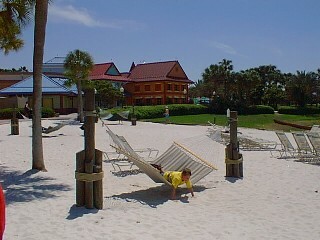 In this picture, Robby is enjoying himself on one of the hammocks. 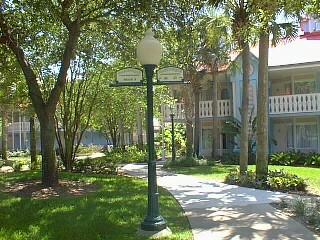 Just behind this beach area you can see Old Port Royale. 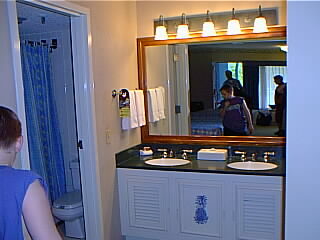 Wow, Disney World is some kind of magical place! Craig and Robby sharing a hammock and not fighting! Notice the water mouse in the background. 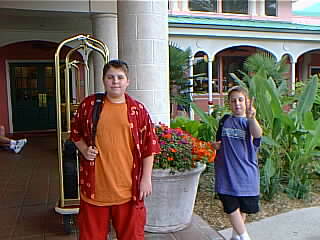 Craig and I rented them at the Grand Floridian and had a ball.